When the Challenge this month for the CHC Canada 150 Food Blog Challenge 2017 was the fresh foods of spring. I knew that other folks minds would go to asparagus or rhubarb as those are the first foods of spring in the stores. Here on the farm.. the first spring foods are Burdock Roots and tiny spring greens, Sunchoke Roots, Tigerlily roots and greens, Horse radish Roots and Greens, Dandelion Greens and Nettles. 2 cups of finely diced greens- Mine was a mix of stinging nettles, horseradish leaves, Danelion baby greens, fresh spring garlic greens, green onions and chives. 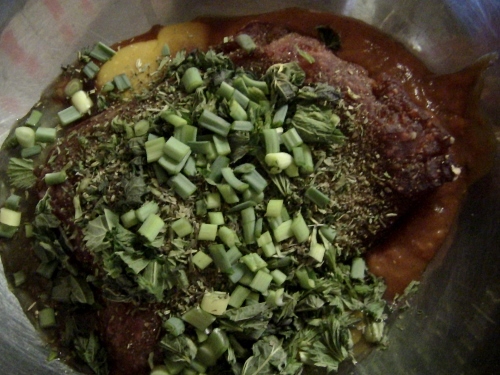 This will give you a very firm filling burger, if you want lighter, consider adding bread crumbs or oatmeal. Mix very well, now you have a couple choices, you can make meatballs, or you can make burgers and grill then or make burgers and bake them or you can turn this into a awesome meatloaf..
To serve, I went and cut a huge handful of fresh horseradish greens, destemmed them, cooked with till Just wilted in a touch of butter, and then mixed them with mayo, with a touch of seasoning salt which was our burger topping, and it was delightful! 4 cloves of galic, finely chopped.. Pinch of sea salt. Soak the mustard seeds in the apple cider vinager for several hours, then blend with the rest of the ingredents till as smooth as you would like it. Makes about two cups, to keep it for longer in the fridge, its recommended to pour a little olive oil on top to keep it fresh and moist. 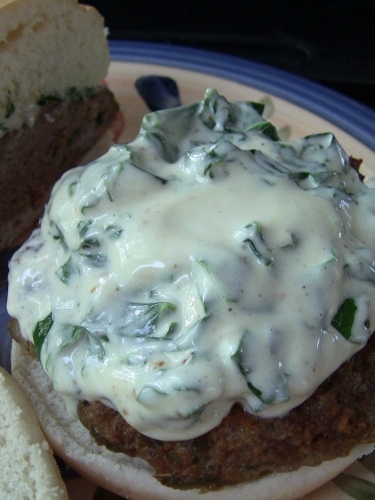 This entry was posted in 100 mile diet, gardening and tagged Canada 150 Food Blog Challange, Dandelion mustard recipe, Homemade Dandelion Mayo Recipe for use on a burger, Wild Spring Greens, Wild Spring Greens Burger Recipe. Bookmark the permalink.